Many people are disappointed because of the low interest rates available today. They look at the fact that their bank accounts are paying pennies per year in interest, and conclude that they cannot get ahead financially. 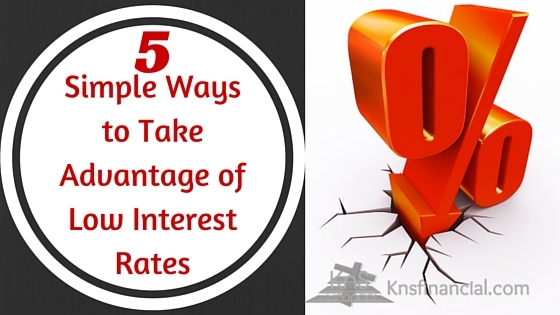 However, there are things that you can do to take advantage of low interest rates. This is one of the most common ways to take advantage of low interest rates. This is because most mortgages involve hundreds of thousands of dollars and span across multiple decades. Even a small change in the interest rate of your loan can have drastic effects on your monthly payments. The best time to refinance your mortgage is when you owe at least 20% less than the appraised value of your home. This way, you won’t have to worry about private mortgage insurance when you refinance. If you do decide to refinance, make sure you perform an analysis to see if the expected savings outweigh the points, fees, and other expenses associated with the refinance to make sure it is actually going to save you money. A great way to pay off your mortgage early is to refinance at a lower rate, secure a lower monthly payment, but continue to pay the higher amount. This way you will be able to pay a few hundred dollars extra on your mortgage each month, without having to change your current budget. Just make sure that your additional payments are applied to the principle of your loan. When you notice that interest rates are going lower, that should be a signal to you that it’s time to negotiate lower rates with your creditors. Give your credit card companies a call and ask them to lower your interest rate. If you have an excellent payment history with that company and you have good credit, you should be able to get them to lower your interest rate. In fact, even if we aren’t in a low-interest-rate environment, you should be able to secure a lower rate if you have those credentials! If your individual credit card companies and banks aren’t willing to give you a lower interest rate, a consolidation may be in order. Actually, depending on my situation, I may try to consolidate my debt first! When dealing with high-interest credit cards, there are typically two ways in which you can consolidate your debt. First, you can apply for a consolidation loan. This is usually an unsecured, personal loan that you use to pay off all of your debt. The main benefit here is – hopefully – a lower interest rate, and only having to worry about making one payment each month. The second way to consolidate your debt is to move all of your debt onto a single credit card. If you can find a card that has a balance transfer offer – such as 0% for the next year – then this can be a great move. Usually, you will have to pay a fee in order to process a balance transfer – just make sure that this fee is less than the money you plan to save by the reduced interest rate. Many people only think of refinancing a mortgage when faced with low interest rates. However, with the price of a new car easily exceeding $30,000, you can save thousands of dollars by refinancing your car loan! I would make the same recommendation to pay it off early. Refinance the loan in order to have a lower mandatory monthly payment, but continue to pay the same amount that you are paying today. If this amount is going directly toward the principle of the loan, you will finish paying it off much faster! There are a number of financial agreements which we enter into, that will allow us to pay a reduced price if we pay the bill in full up front. The most common charge that I can think of which fits this description is car insurance. Most companies charge a fee for breaking your premium up into monthly payments; thus giving you a discount for paying the full charge up front. Sometimes landlords will be willing to give you a discount on your rent if you pay up front. The discount may increase as you add more months to your initial payment. Paying your rent a year in advance can lead to real savings. The same is true for many other arrangements where there is an option to pay over a long period of time versus paying the entire amount due in the beginning of the agreement. You may be thinking to yourself, “I can make prepayments at any time! This has nothing to do with interest rates”. However, the reason why this is tied to low interest rates is because you have less incentive to put out $15 – $20,000 all at once, if rates are high. If you can earn a high interest rate by putting your cash in a savings account or CD, then you will not be inclined to pay your rent a year in advance, unless the savings in rent are more than what you would earn in interest. Therefore, low interest rates make it financially feasible to make prepayments in order to secure a reduction in your purchase price! Do you take advantage of low interest rates to reduce your debt payments? Have you ever taken out a consolidation loan? Do you feel more justified in living above your means (borrowing money to pay for expenses) in a low interest rate environment?